This place is an artist's paradise and inspiration is around every bend. Today I walked the streets of Honolulu going from one incredible gallery to the next. From photographers and painters to wood carvers, it's teaming with creativity. It's so inspiring I might have to write a story based in Hawaii! I met an amazing lady, Dora Barrera, who really set my afternoon into a good vibe. She works at the Peter Lik Fine Art Photography shop. Remember what I said about a picture being worth a thousand words? Well this place could make Webster's dictionary look short. 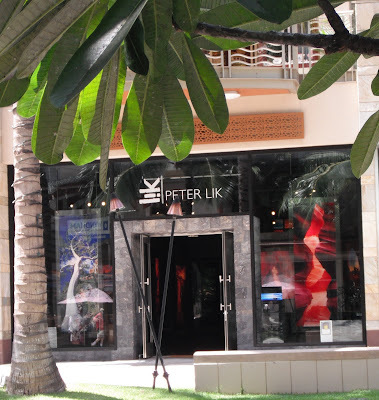 Peter takes pictures all over the world, specializing in Utah and Hawaii. The way he captures light is unbelievable. If you don't think photography is an art then you haven't seen this man's pictures. While Honolulu is a big city and I'm not real fond of big cities, I do love the people here and coming back is like coming home. Time for me to go register for the retreat! You guys enjoy the link below and I'll check in tomorrow to let you know how things went! WoW, I checked out the link you provided and this looks like a real classy place. Glad you're having fun in Hawaii, can't wait to get there myself!